Imagine this: It’s the middle of winter and you’re wedged into the comfort of your favorite armchair. A fire crackles in the fireplace and your senses are awakened by that smoky smell. Your belly immediately rumbles thinking of all the delicious smoked meals you made this past summer. You wish more than anything that you could grill up those juicy steaks you have chilling in the freezer. If only it wasn’t beyond freezing outside with almost ten inches of snow… Good thing we have these 5 tips for cold weather pellet grilling to help you out. The arrival of winter weather doesn’t mean your grilling season has to end, it just means you have to take a few extra precautions. These tips will help ensure delicious meals and help you stay safe. If you’re up against snow, you’ll want to make sure to shovel a path and clear any snow or ice off your pellet grill. You’ll most likely already be out in the frightful weather shoveling your driveway, so might as well circle around back and make a path to your grill. This will help you efficiently go from your warm home to your grill and back, without having to deal with wet socks. We recommend that you buy a grill cover to help protect your MAK from the elements. This makes winter grilling simple because you’ll just brush the snow off the cover and you’re ready to go. If a cover isn’t in the budget, you can always use a broom to clear off the snow. 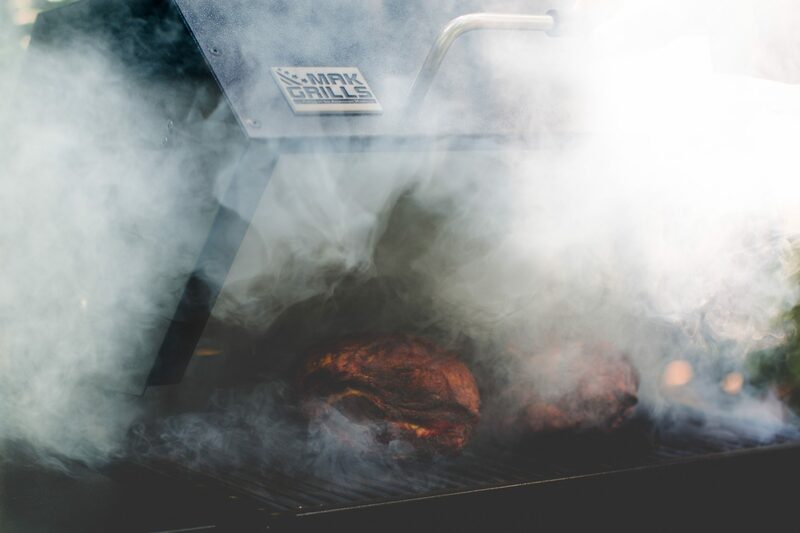 We know how tempting it is to open the lid of your grill and sneak a peek at your smoked masterpiece. As tempting as it may be, it’s especially important to resist that urge in the winter. The moment you lift the lid, the temperature inside your grill drops significantly. This causes your food to cook much slower and can possibly ruin your dish. Once you situate your morsels on the grill, close the lid and head back inside. You can trust your MAK grill to cook your food just right. It’s important to note that food safety is our top priority and it should be yours too. According to the Center for Disease Control and Prevention (CDC), there are about 1 million Salmonella cases reported annually in relation to tainted food. If your pellet grill is having problems maintaining the proper temperature, this can put your food at risk. 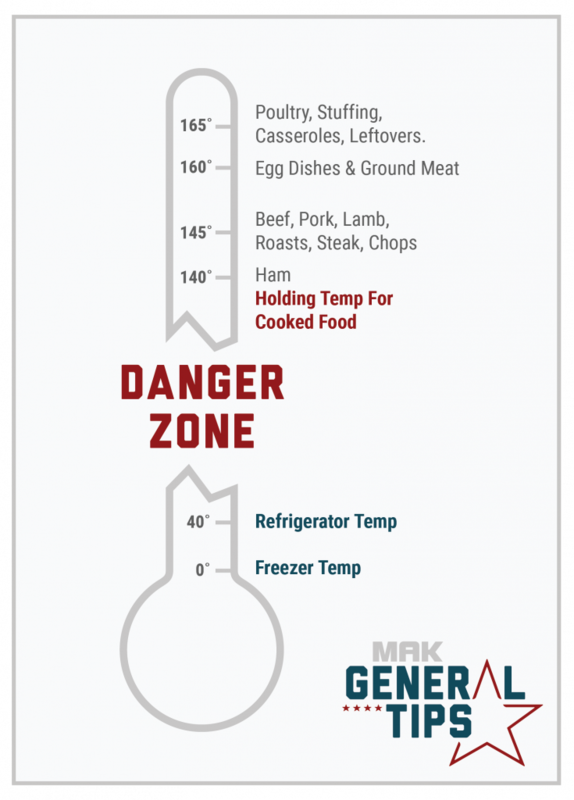 Certain types of meat need to be cooked at different grill temperatures. In the winter, it’s especially important to be aware of which temperatures are safe and which aren’t. You also have the option to use our Remote Boss. This device allows you to grill wirelessly via BlueTooth technology. You’ll be able to control every aspect of your pellet grill from up to 300 ft. away. It will even function through walls, meaning you can change the temperature of your grill without stepping foot outside. You’ll want to make sure that you load up on extra pellets since you’ll be burning through them quicker. Certain pellets that yielded good results in the summer, may not be the best option for the winter. For example, pellets with chemical fillers or recycled wood material won’t be able to keep your grill at the right temperature as it pulls in cold air. You’ll want to use a high-quality hardwood pellet. This type of pellet burns at a very high and consistent temperature, creating the perfect cold weather grilling conditions. Not only must you pay attention to the safety of your food, but you must also pay attention to your personal safety. Winter weather can fool you. When it’s a beautiful sunny day and your outdoor thermometer presents a decent temperature, you may conclude that bundling up isn’t necessary. The problem is that most people don’t take into account wind chill and external body moisture. Both of these factors can cause a chill that dramatically changes your body’s rate of cooling. This can leave you more vulnerable to frostbite and hypothermia. In that case, our advice to you is to always wear a heavy winter coat, gloves, hat, and warm boots when grilling in the winter. It’s better to be safe than sorry! Use these 5 tips for cold weather pellet grilling the next time you want to do some cold weather grilling with your Mak Pellet Grill and you’ll be grilling like a cold weather champion!